Left to right: Kitten, Meerk, Patch. Background: Ty Cougar. Any news media story that covers furries is likely to focus heavily on fursuiters, and their striking visual appeal and fuzzy glamor. Fursuiters can't represent the whole of furry fandom, when "furry" is a vague and broadly defined umbrella over anything related to anthropomorphic animals- but I think it's OK to consider fursuiters the expressive, theatrical soul of furrydom. There is an element of "ambassador" role to their hobby. Without the 15-20% of furries who wear fursuits and costumes for role-playing, you'd just have regular unglamorous nerds saying "meow! I'm a cat". That's what crazy people do. Keep your eye out for the 2012 Golden Hairball award winner for "Best Dressed" at 6:56. 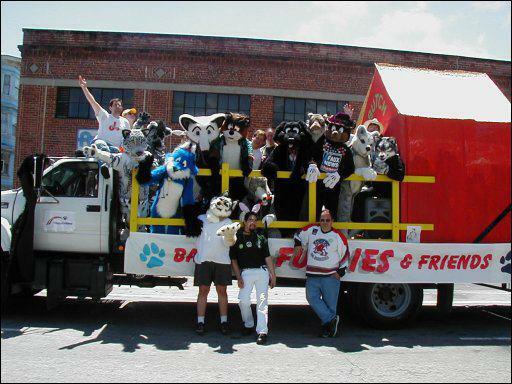 The last organized furry participation was a float in the 2005 Pride parade, arranged via BAF and its mailing list. 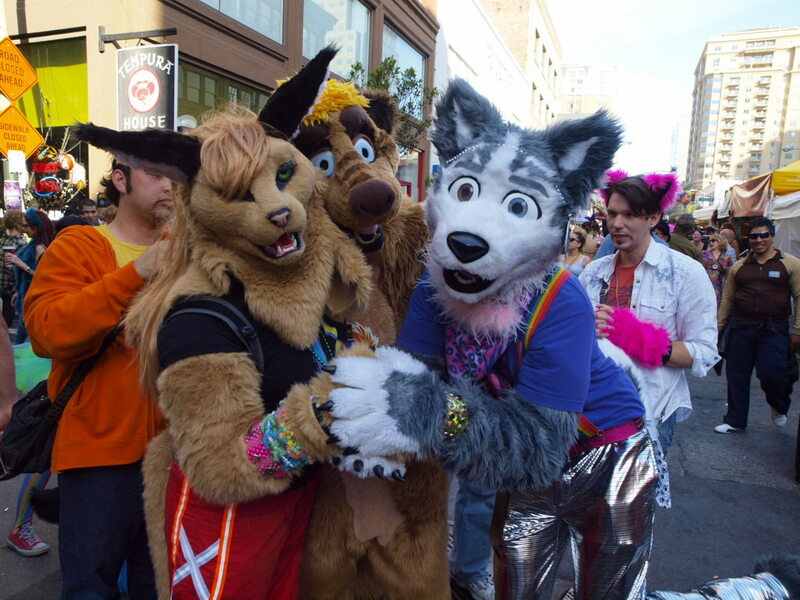 (I heard that there was some negligible drama about connecting furries + LGBT, but it stayed internal, with positive reactions elsewhere.) Due to logistics and cost, it hasn't reoccurred.